The Fate Of Mankind Hangs By A Thread! On a space flight traveling from the planetoids to RealEarth, Joshua Keeper has discovered a secret so big, it threatens the safety and freedom of all of humanity. Joshua must reach inside himself to find the courage to fight or all is lost. But, Joshua has his own secrets to keep and he's got to stay alive long enough to get to those who can help. Who can he trust? Who can he turn to? He's the new guy, why would anyone believe him? Technology, has created wealth and freedom for all to enjoy, Joshua loves it, but it may just turn out to be the evil that he was warned of. On RealEarth, a crime wave has been associated with his ship, The Maiden. Authorities want to investigate the crew as soon as they land. The ships' personnel officer is suspicious of him. She knows he's hiding something. 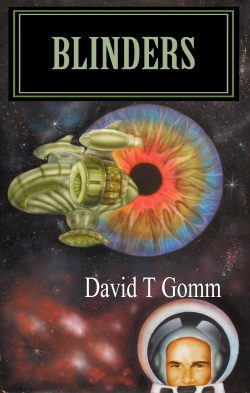 David T Gomm has written several science fiction novels. This is the first title to be published. He doesn't care for novels that jump back and forth as many do today. "It's not fair to the reader, making them work too hard to follow the plot line...this is also a trend in films and television which I don't care for. Start the story where you need to and then head to the end. Some jumping around is acceptable, but too much just wears us out!"